Winter started early in Edmonton this year. We had a few snow days in mid-September and a few more in early October. The last two weeks though, have been relatively warm, with sunny afternoons in the low to mid-10s (Celcius). Early afternoons aren’t the birdiest in the Mill Creek Ravine woods, but I usually bring my camera just in case. Yesterday, I saw a Wilson’s Snipe! I’ve never seen one in that area before. I guess it picked an unusual stop on its migration south. Unfortunately for me, he/she mostly stayed behind tall dry grasses and naked shrubs, so I couldn’t focus my lens on the bird and snap a pretty photo. 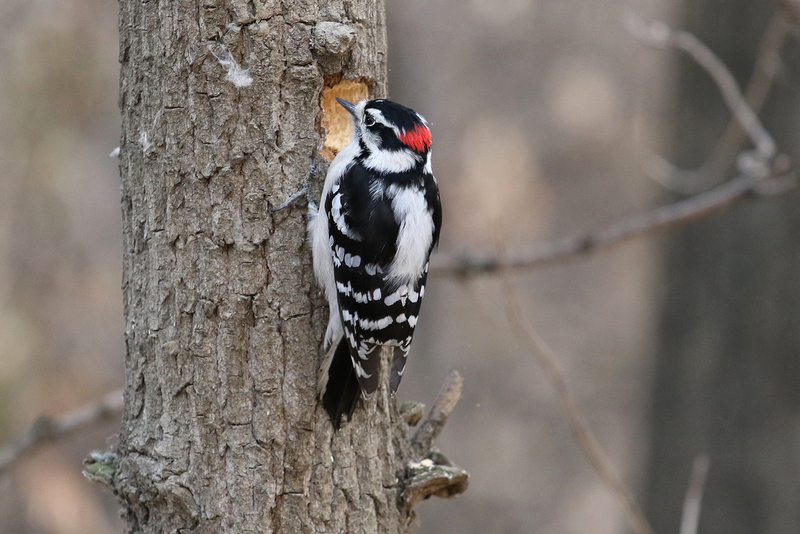 I also saw two beautiful woodpeckers – a male Hairy Woodpecker and a male Downy Woodpecker. The Downy Woodpecker gifted me a little camera action.